A game by Acid Nerve for PC, Mac, Linux, PS4, and Vita, originally released in 2015. 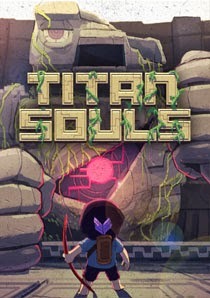 Titan Souls is an action game whose design is very much inspired by that of Shadow of the Colossus. The player wanders the land alone, equipped with a bow and arrow, on a quest to seek out a number of giant creatures. Upon defeating these great beasts, their life essence is removed and absorbed into the body of the player character. Throughout his journey, the player faces off against more than a dozen titans, each of which requires a specific strategy in order to defeat. 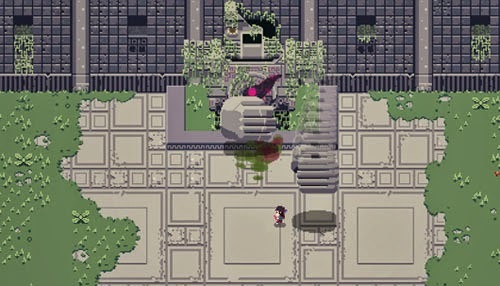 Where Titan Souls departs from the design of Shadow of the Colossus is in the fundamentals of combat. In Shadow of the Colossus, battling the colossi was a lengthy struggle that involved luring the creature, making a harrowing climb over and across its body, holding on for dear life as the thing moved and turned, and eventually seeking out weak points in order to stab them with your sword and wear the creature down slowly. In Titan Souls, on the other hand, battles are won or lost in a single strike. Controls are minimal, but the player must make careful use of all of the tools at his disposal. The player is able to perform a quick dodge roll, and holding the DODGE button allows him to run. The player’s running speed is slower than that of the dodge, so it is important that the player reserve use of the dodge to escape quick attacks. There is a cooldown period after performing a dodge roll, so players cannot continuously spam the move. By pressing the ACTION button, the player stops moving and draws back his bow, freely aiming in any direction. The longer the player holds the button, the more powerful the release will be, and the arrow slows down over a distance, eventually rendering it ineffective. Aiming and timing shots is important because the player only has a single arrow. 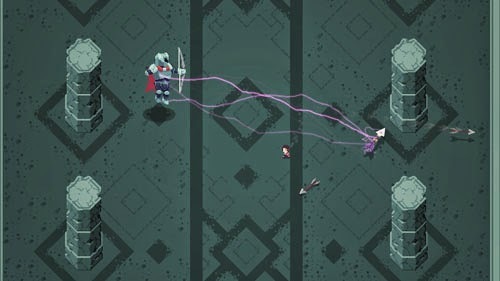 Once the arrow is fired, the player must either run over and retrieve it, or use his powers of telepathy to draw the arrow back to his hand… potentially hitting a titan’s weak point in the process. 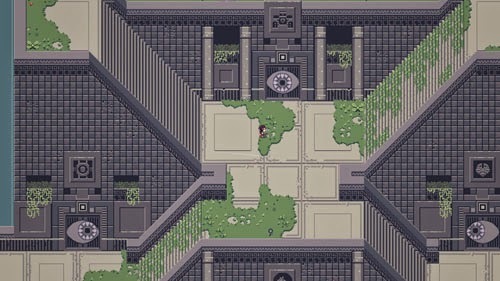 When the game begins, the player makes his way to an open area that has four doorways, each leading to a different titan. These titans may be approached in any order, but they must all be defeated before the player is allowed to move into the next area and face off against more of the creatures. 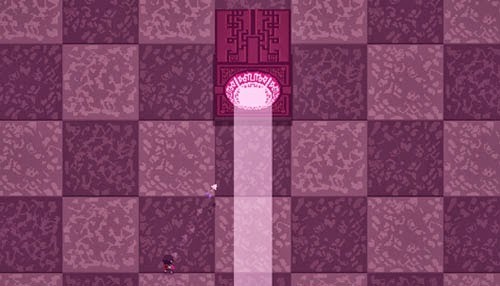 When the player is killed, he is returned to a nearby save point and must walk back a short distance to face the boss again (or select a different door to try his hand at another). 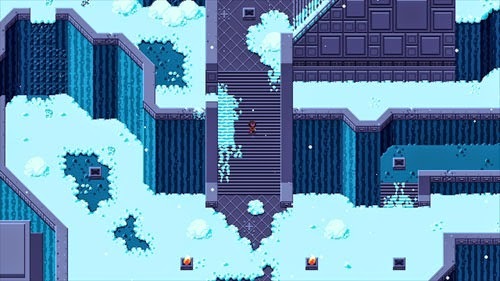 While the distance back to a boss is short, it can become frustrating on occasions where the player finds himself killed many times in succession. Each boss lies dormant when you enter the room, and you must shoot it with an arrow in order to awaken it and cause it to engage you. This design plays on a similar theme in Shadow of the Colossus in that the creatures are essentially innocent and only attacking because they were provoked. 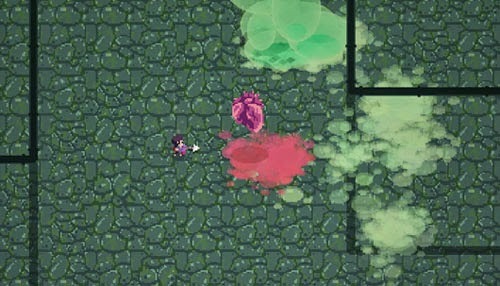 Once the creature springs to life, it immediately begins its assault on the player, potentially killing the player with its very first strike. Since the player is killed by a single hit, every action the titan takes can be deadly. However, the same logic applies to the titan as well, and a single well-placed arrow will take the creature down in one hit. The key to making progress in this game is to stay alive long enough to analyze the titan’s patterns and discover its weak point. Once this is done, the player must put his skills to the test in order to exploit it. In support of this 1-hit kill design, titans’ weak points are exposed for a very short time and require precise movement and aim on the part of the player. If not for this, battles would be over in a matter of seconds. In fact, once the player discovers the titan’s weak point and understands its movements, most of them can be defeated in just a few seconds. This is especially true since the titan’s initial movements are the same each time the boss is engaged, making these behaviors the most predictable. Killing a titan generally means firing an arrow precisely into its weak point within a narrow window, but titans can also be killed while retrieving the arrow, allowing for situations where the player fires an arrow past the boss and then hits a rear-facing weak point as he pulls the arrow back to him. 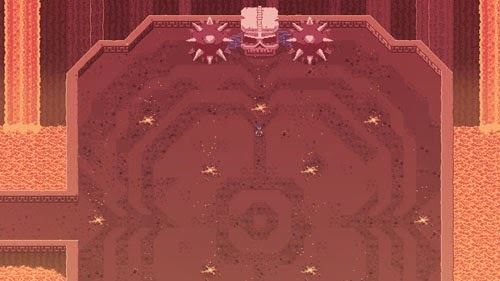 There are also occasions where the player must defeat bosses with a series of strikes, such as hitting a bunch of blobs that split in half with each hit until the pulsating heart within is revealed. 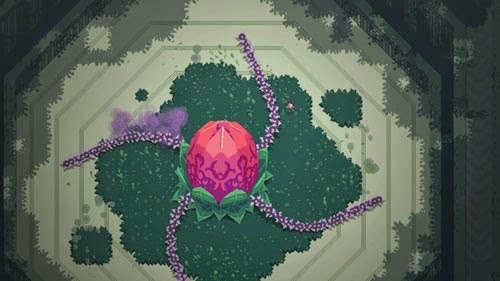 Another such battle involves a plant creature that requires the player to fire an arrow into its mouth, and then retrieve the arrow to pull down one of the protecting leaves, thus opening up its weak point and the opportunity for an instant kill. Arenas generally consist of a wide area of solid ground that allows the player to freely run and dodge attacks, but things are changed up from time to time. For instance, one arena has stone pillars that provide limited protection to the player while also obstructing the use of his arrow. In addition, the player cannot telepathically retrieve an arrow if it is on the far side of a solid object. Another area has the player firing his arrow through torches in order to light it on fire and melt a block of ice protecting a titan. 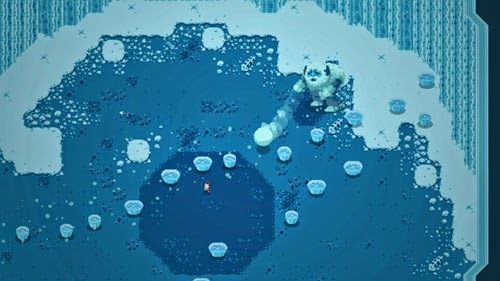 Yet another sees the player standing on small floating ice islands as a creature rises up from below to attack, occasionally smashing through the islands to temporarily destroy them. Arenas often extend off the edges of the screen, and the camera generally keeps the player character and the titan within view at all times, but there are several occasions where titans will move off the side of the screen and attack from out of view. 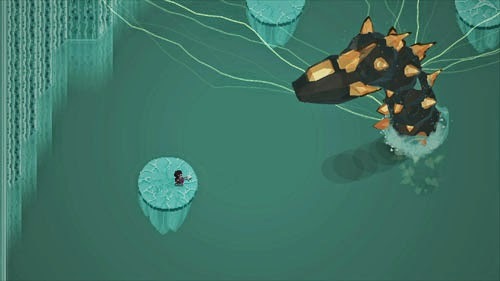 It is sometimes possible for the player to dodge these unseen attacks by paying attention to the timing or accompanying audio cue, but more often, losing track of the titan for a few seconds spells a quick death. The first area is the only place where all of the titans must be defeated in order to move forward. Once this challenge is overcome, the player moves into an open world where titans must be tracked down across a huge landscape, encompassing waterways, forests, caves, ruins, snowy mountains, and even a fiery inferno. There is occasionally some light puzzle solving in order to pass through certain areas, but the solutions are generally clear. There are also some areas that are not directly exposed to the player. There are no roaming enemies or pickups of any kind, so much of the world stands barren and is only in place to be traversed rather than overcome. Aside from the structure of the world, there is nothing in place that adds additional depth to the proceedings, aside from a few pictographs and a miniscule amount of lore. In the end, the game is essentially a series of boss encounters... although the 1-hit kill design doesn't logically lend itself to combat with other enemy creatures outside of these encounters. 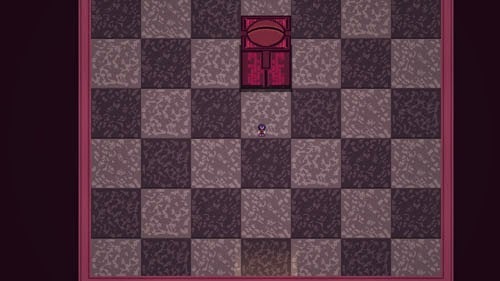 Making progress through the overworld requires that players open up seals by defeating certain sets of titans, which means that it’s possible to complete the game without ever encountering some titans, or even without discovering where all of them are located. However, finding and defeating all of them does allow the player to reach the true final ending and boss. Completing the game also opens up a Hard Mode, an Ironman Mode, and the ability to disable the dodge roll. 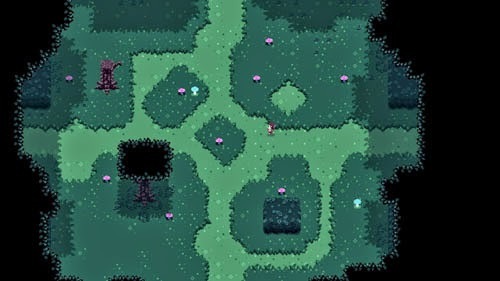 Titan Souls was developed by Acid Nerve, a studio based in Manchester, UK. This was the studio’s first commercial release. The game was published by Devolver Digital, which has published a number of 2D indie games including Serious Sam: Double D XXL, Luftrausers, Broforce, Foul Play, Fork Parker's Holiday Profit Hike, Hotline Miami, Hotline Miami 2, Not a Hero, Ronin, Downwell, Enter the Gungeon, Mother Russia Bleeds, The Swords of Ditto, Minit, The Messenger, and Crossing Souls.